Being Joe’s birthday, 13th October was already on my list of important dates. As it happens, 13th October 2015 also turned out to be the day I quit my job to travel the world. I didn’t exactly shout ‘I QUIT!’ and storm out the office (as much as I’ve fantasised about doing precisely this). I have an 8 week notice period, which makes it slightly less dramatic. But still, I made the decision to pack up my lovely life in London and say a big fat YES to the slightly more terrifying option instead. I decided I would pursue my dreams after all. And best of all? The love of my life is in the exact same frame of mind as me, so we’re off around the world together. As you can probably guess, I’m going to document the whole experience. I want to write about travelling from the point of view of someone who, in reality, isn’t particularly carefree. Someone who struggles with change, who feels anxious without a plan and who wears a full face of makeup every day. Someone who over-thinks everything, is a massive perfectionist, and often likes to be alone. Someone who recently went through a phase of feeling constantly scared and worried about quite literally everything. 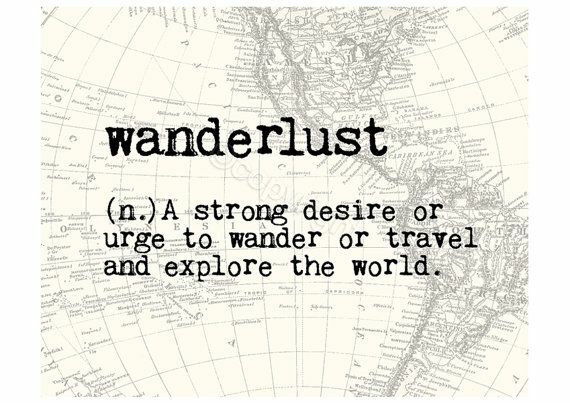 Not your typical criteria for a free-spirit backpacker, and not at all how I come across to other people (I hope). These are all things that I generally keep to myself, but have started to confront in various ways. Being open about these incredibly common challenges over the last few months has taught me one major thing: you can change the way you think. What better opportunity to push yourself to the limit than to expose yourself to completely different beliefs, attitudes, cultures, histories, societies, weather… And what better opportunity for a writer? I often feel like the reason I’ve become preoccupied with what’s going on inside my head is because I’ve forgotten how to utilize my time. Doing the same old job and having the same routine every day can leave big gaps in your mental capacity, gaps I seem to have filled with worrying about unimportant things, like how many Instagram followers I have, or what colour shellac I want next. In a nutshell, I want to care less about superficial rubbish, and much, much more about what’s important. These ‘important’ things, I hope and pray, will materialise somewhere along the way. And if go away to realise that I just want my old life back, that’s totally fine too. Aside from doing a stereotypical bit of soul searching, I also hate how ignorant I am of how other people live. The only times I’ve travelled outside of Europe I’ve stayed in super-luxurious resorts, which I find quite embarrassing. I want to be able to read the news and associate and empathise more deeply with what’s going on. Another huge factor is that I’m wary of how incredibly dependent I’ve become on material things. Living out of a single bag for 6 months ought to teach me a thing or two about what I actually need in life. I’m already 99% it won’t be the Smashbox primer I wouldn’t dream of foregoing right now. It costs £25. I wonder what £25 will buy me in Cambodia. Aside from all of this, I just want to have fun. Like, constant fun. With my boyfriend. For 6 months. Who the hell wouldn’t? And then when I get home, I promise to put the whole experience to good use. That’s fair, right? I know how privileged I am to be able to up and leave my life for a bit. I’ve worked hard and saved to be able to do this, so I’m determined to make it count in a way that I probably wouldn’t have a few years ago. Plus, I still want to be a writer, and I’ll be doing much more of that in my own time, instead writing about the same boring crap at work every day. Right now, I would rather write about Japanese culture for free than get paid to write about dressing gowns. And I can say that because a) I’m still young and stupid enough not to care and b) I have zero responsibilities. I will always have an uncontrollable urge to write and tell stories, and I think travel goes hand in hand with that. That doesn’t mean I’m not completely TERRIFIED. If you have ANY tips, suggestions or words of advice for a first-time traveller, please, please, please comment below because I’d love to hear them.